The Private Bath in Gellert Spa & Thermal Baths was built in 1918. You can spend some intimate time and enjoy the hot water tub on your own. 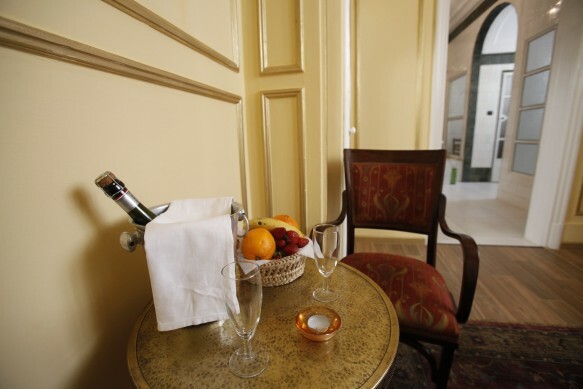 The rental of the private bath includes a nice fruit bowl and a bottle of sparkling wine. A romantic treat for couples, fun for friends, and an ideal solution for those who seek privacy for cultural reasons. In 1918, like many of the facilities of Gellert Spa, were ultra modern and high tech, including the private bath tub. Today the Private Bath is not merely a hot water tub, or a giant bathroom, but also a historical monument of the 1920’s water healing movement when many of the baths in Budapest were reborn. These days, the Private Bath is almost a hundred year old, and is still in use, nicely restored. For a modern bather the Private Bath may seem like a spacious bathroom with nice tiles and a nice bathing tub. The Private Bath Tub and the adjoining room offers privacy for couples in Gellert Bath for a few hours. You can relax in the hot water tub with your better half without having to share the bath with other tourists. The Private Bath has its own private entry. Its area is completely separated from the general public bath and pools. Only guests renting the Private Bath can have access to the Private Bath Tub and its historical room built in 1918. If you wish to enjoy Gellert Spa in privacy, we recommend reserving the Private Bath. Please see more info about the reservation, prices and conditions. You can book the Private Bath in Gellert Spa via our online booking form on the left side. Please pick your date and your preferred hours for your bath visit, and we will try to reserve you the best available hours. 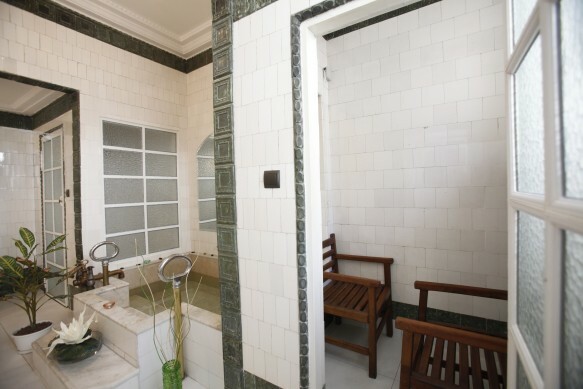 The Private Bath is popular amongst couples and friends who wish to spend a few hours in some privacy while enjoying a hot water bath in a historical bath tub built in 1918. The Private Bath in Gellert Spa can be rented for 3 hours, usually rented for 2, but is available for up to 4 people. The rental fee includes the use of the Private Bath Hall and Tub (plus its facilities) for 3 hours, a fruit bowl and a bottle of sparkling wine. The Private Bath Hall can be closed from the inside so that only you and your guest(s) can use the hall and its adjoining rooms or facilities. As you enter the Private Bath Hall, you will first step into the smaller Entry Hall with a mirror, wardrobe and an armchair. You can store your belongings here in the wardrobe. Next, you go into the Private Bath Hall itself where the historical bath tub is (inside Zsolnay porcelain). You can alternate the hot water tub with the private dry Sauna (a heated cabin with 2 chairs). Refresh yourself with the fruit bowl, and get relaxed. You can celebrate with the bottle of sparkling wine (can be replaced with water if you wish). Spend some intimate hours in one of the most famous thermal baths in Europe: in the historical Private Bath Hall of Gellert Spa & Thermal Baths, which is almost a hundred year old. Time travel, relaxation and privacy. The Private Bath is a nice gift for a Romantic Budapest holiday, Christmas in Budapest, Valentine’s Day Cruises in Budapest, on New Year’s Eve, etc. Hi, i just booked but only got email from Paypal. can you please send me a confirmation mail with the date and time? Your reservation is valid and complete. Out of office hours bookings submitted after 6pm -such as yours – will be confirmed the following day until 11 am (local time Budapest). Hello, I still didn’t get the email. Can U please confirm here the date: 03.01 from 15:00 till 18:00? And I have a question: do we get towels there or should we bring ours with us? If I book a private spa for 2, do I also need to pay the general admission fee (to enjoy the full experience) or not? If you wish to visit the in- and outdoor pools in Gellert Spa, you need to buy a separate entry ticket. when is it most quiet in the baths? On weekdays? In the morning?…. if you want to pick the best time of the day, we recommend visiting the baths earlier in the day, either in the morning around 10am, or around noon, e.g. 1 pm. towels are not included, so we recommend you bring your own towels. The towels can be rented with a deposit of HUF 2,000 and a towel rental fee of HUF 1,000. Flip Flops are mandatory to be worn.